Over the next few days I will be introducing a variety of moms that I have met through blogging. I asked them all a series of questions and have loved reading their answers – so I hope my blog readers enjoy them too! I am calling this series “A Mom a Minute.” Today, let’s spend a minute with Janine, from Janine’s Confessions of a Mommyaholic! Tell us about your kids – how many, boys/girls, names, ages, etc. I have two little girls, who are 16 months apart or more commonly known as Irish Twins. Emma will be 4 years old in July and Lily is almost 2 1/2 years old now. What are your kids into right now? TV Shows, music, movies, toys, books, etc? What are their favorite things? My kids honestly love Disney Jr. and watch the Mickey Mouse Clubhouse, Princess Sophia, Doc McStuffins and all the Princesses, too. They also love to read, especially Pinkalicious, as well love to play with their many toys including their craft art table, where they draw and write constantly. What kind of activities are your kids involved in? If they are too little for activities, what do you think you might want them involved in when they are older? 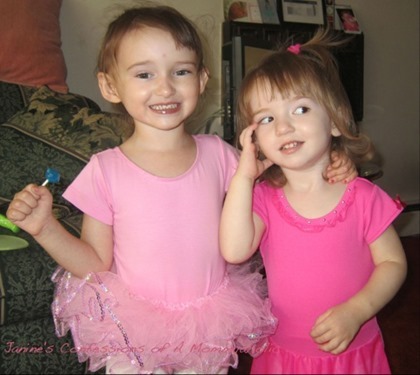 Both my girls are in dance and will be in the dance school’s dance recital in June. This is Emma’s second year and Lily’s first. In the future, we may also try soccer with them, but not just yet, because dance seems to take up enough time right now. Where have you gone with your kids that you’d recommend to others? Children’s museums, amusement parks, vacations? Last summer, we did quite a few things, including vacationing with my husband’s family in a joint beach house in Connecticut. Both my girls loved it and Emma couldn’t get enough of the beach. We also have gone to the Queens Zoo, the Long Island Aquarium, as well as the Mystic Aquarium. Also, we have gone to The Children’s Museum, The Long Island Game Farm and many other day trips locally. All of the above, we found were quite fun to visit and would recommend. Are your kids picky eaters or do they eat whatever you make them? What are their favorites? Emma will eat just about anything and is such a great eater, which is ironic, because she has always been on the smaller side for her age and very petite. Lily, on the other hand, is my picky eater and will fuss over just about anything. I have found when all else fails I give her cereal, like Cheerios and go back to the drawing board! What is your mom super power? My super mom power is being the most affectionate mother that I can be and constantly making sure making sure to give my kids hugs, kisses and tell them how much they are loved daily. What is your biggest mom challenge or struggle? 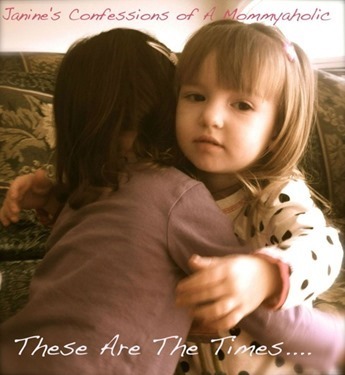 The biggest challenge, for me at times, is how close in age my two girls are, because they sometimes can double team me in what they may want or need from me daily and yet, this same weakness is also a godsend to me, because they truly are so good together. See they play so nicely with each other and are truly each other’s best friends. What has been your biggest surprise as a mom – something you do that you didn’t think you would ever do or something you just didn’t expect? Well, I must admit Lily was a huge surprise and had never planned on having two kids so close together, but as I already shared this really has been one of the best things that I never planned!! Also, I must admit I never thought I would start to sound like my own mother, but yes I do on many days and occasions now. That said my mother honestly was the best mother so it can’t all be bad!! Give us some Mommy advice! My best advice is learn how to roll with the punches and expect the unexpected, because being a mother is not something you can really take a course and learn exactly what to do day in and day out. You are constantly learning and that is Ok (actually more than Ok!!). Don’t forget to visit Janine at her blog! And come back for more mom minutes this week!